Earlier this month, the groundhog predicted six more weeks of winter, and as the Facebook meme says, our weather here in Colorado will do whatever it wants, which means temperatures from below zero Fahrenheit with a nasty wind chill to 70 degrees and sunny within a 24-hour time span… and likely a blizzard in mid-May. So, allow me to introduce you to three excellent pieces from Outdoor Research’s collection of women’s winter mid-layers that function well as outer layers, too, as the weather allows. 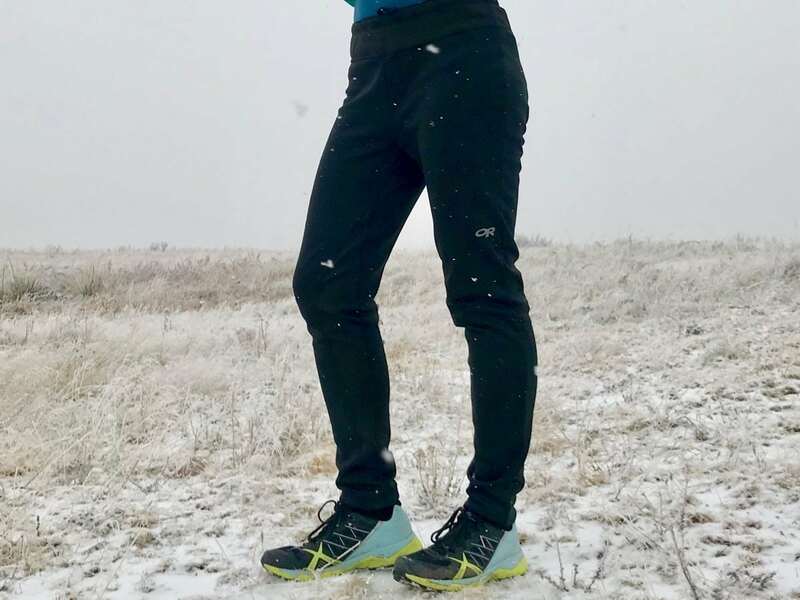 The Outdoor Research Radiant Hybrid Tights ($80) are an excellent addition to my collection of colder-weather running pants. I’d call them pants instead of tights as they’re not super form-fitting, especially through the hips and thighs. There’s a bit more of a snug fit through the calves, which allows them to taper nicely and fit under gaiters or post-run boots very easily. I don’t mind doing errands and school pick-ups and drop-offs pre- or post-run in these because of the slightly looser fit. There’s a small key pocket with a fold-over lip attached to the inside of the waistband on one side of the women’s version, which is adequate. However, I had the fortune of trying on the men’s version, which come with zip pockets on the hips, and I’m pretty jealous as I much prefer those with how the Radiant Hybrid Tights fit. 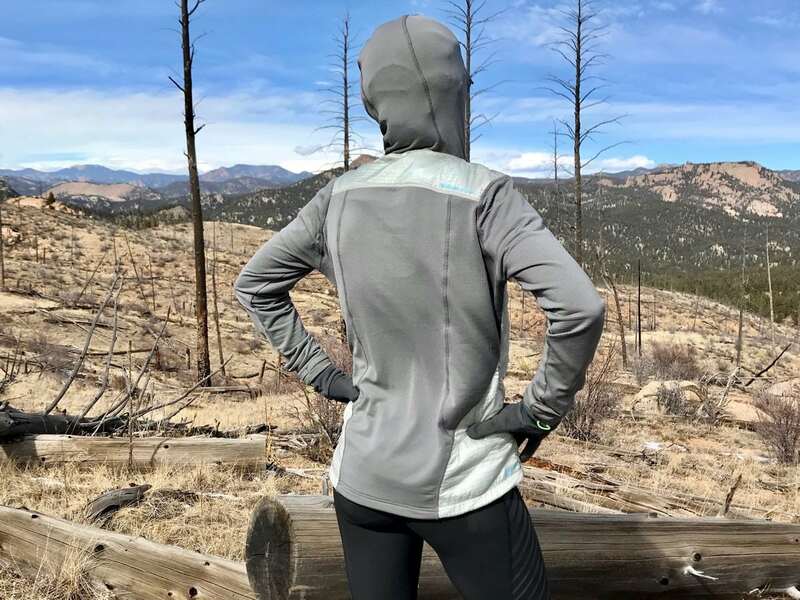 The Radiant Fleece fabric is 95% polyester with 5% spandex and has a tight, smooth face and thicker feel, which allows for a surprising amount of wind protection and warmth for as light as it is (9.4 ounces/267 grams in a women’s medium). The ‘Hybrid’ in the name comes from the use of the Radiant LT Fleece, which has a slightly higher spandex content (94% polyester/6% spandex) and is used in the waistband and the inseam panel for a bit more stretch and comfort with movement. They function quite well on a windy day with temperatures below 35 Fahrenheit. I tend to get a little warm in them as the temperature rises above 40, though. For truly nasty conditions, it’s not difficult at all to slide a pair of wind or rain pants over these for protection (prairie-blizzard style). I was also able to comfortably wear a pair of long-underwear shorts beneath them on a calm day with temperatures in the 8-to-15-degree Fahrenheit range. The calves are snug enough that full-length tights beneath would not be the best option for me; this might not be an issue for others. Getting the correct size in these was a bit challenging as my measurements are in the middle per usual. The women’s medium was significantly too large through the hip and waist but fine in the thighs and calves. The women’s small fit well through the hip and waist but is rather snug in the calves, though not in a function- or comfort-limiting way. The feel of the rise in the women’s version is strikingly similar to a men’s pant; this is the only other thing about these that I would change. The extra length in the rise caused the pants to get pulled down slightly as I ran and I did have to hitch them up from time to time even within a 60-to-90-minute run. If they could dial in the women’s fit a bit more specifically, these would be near perfect. Outdoor Research Radiant Hybrid Tights back view. The Outdoor Research Radiant LT Zip Top ($90) utilizes the same Radiant LT Fleece fabric mentioned above. It has the same tight, smooth face that glides well under a wind shell. As with the pants, I’d call the fabric wind resistant because it’s significantly better at wind protection than most fleece garments of similar weight yet does not have a wind-resistant layer added to the garment, which means the breathability remains excellent. This half-zip top is definitely a trimmer fit and isn’t particularly long in the torso. I received the small size, which works fine with a thin, smooth technical layer beneath, but there is definitely not a lot of room left in the arms beyond that one extra layer. The bottom of the garment hits me just at the top of my hip bones (the ASISs—pointy ones in front), which means I definitely tuck in the layer beneath for core warmth on windy days. I’d likely size up to a medium if I purchase another. Outdoor Research Radiant LT Zip Top front view. 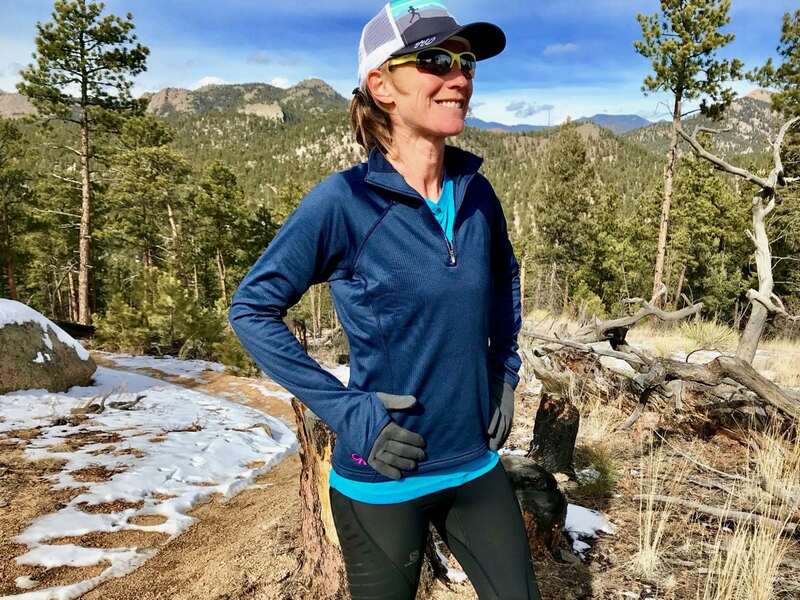 As to other features of the fairly simple zip top, I love the thumb holes—all my long-sleeved gear should have these—and the comfortable cuffs on the ends of the long arms. I can get my hands up inside the sleeves to start and then sneak them out as I warm up while leaving the thumb loops on as needed. The half-zip is just long enough for adequate heat management on a warmer day (above 35 degrees Fahrenheit without wind), but strangely enough, there’s no zipper garage at the top of the zipper. This makes for some cold and slightly abrasive interaction with the skin at my neck. This would be a relatively easy fix that would do wonders for overall comfort especially on the days where wintery conditions demand full zippage. Overall, I find myself reaching for this fleece on the windy days with temperatures below 40 Fahrenheit as I get a wider range of warmth before having to add a wind shell. Outdoor Research Radiant LT Zip Top back view. 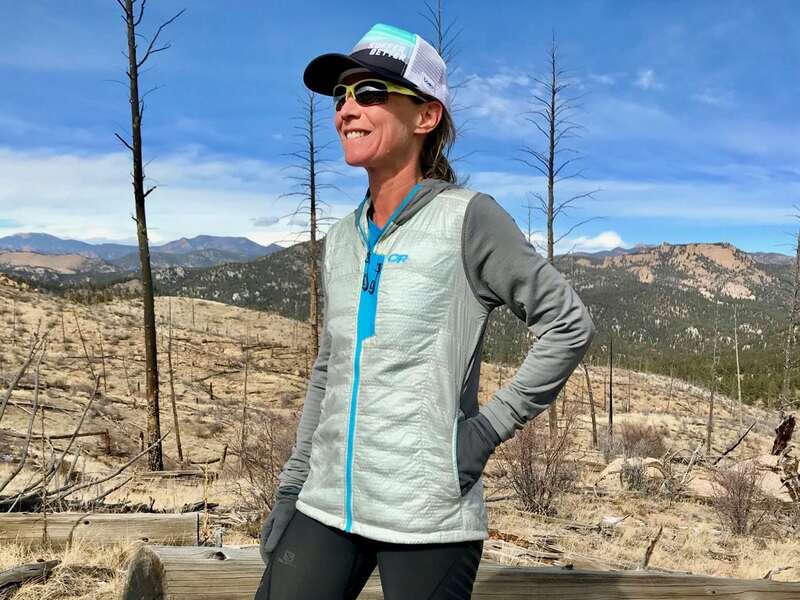 The Outdoor Research Deviator Hoody ($189) is a fabulous lightly insulated piece that, in my experience, functions best as a core-warming mid-layer during highly aerobic activities, despite the fact that I often wore it as an outer layer. What can I say? Colorado winter has been confusing. This 9.3-ounce (women’s medium) garment packs a fair amount of highly breathable warmth into the layer over the front of the body as well as a strip across the upper back courtesy of the Polartec Alpha insulation (64 g/m2) beneath the 100% nylon 7D ripstop. The inner liner behind the insulation is 100% polyester stretch mesh, which is highly breathable and wicks any moisture away from your inner layers quickly. Amazingly, the moisture doesn’t seem to bog down in the insulation. It gets whisked right out of the garment and evaporates. Outdoor Research Deviator Hoody front view. The arms, back, and hood are made with Polartec Power Grid 2L, which is very lightweight, so pleasantly soft, and almost too breathable considering the warmth of the core section of the piece. I think this is a terrific fabric for the back and hood of this hoody, however. On chilly, windy days, I found myself perfectly temperature controlled through my core but wishing my arms had another layer at least. On relatively warmer days, the heat loss through the arms and back provided a nice balance to the insulated body, but on a sunny 40-degree Fahrenheit day without wind, it’s still a bit too warm. This highlights my initial comment that the Deviator Hoody is likely best used as a mid-layer on colder and windier days beneath a wind jacket because if I keep the wind off my arms, the jacket is amazing. If the arms were made somewhat more substantial like perhaps with the Radiant LT fabric, this would be an incredible outer layer as well. This jacket has other features that I appreciate. The zipper and pull tab work flawlessly with and without gloves and the fleece gutter at the top keeps my neck and chin happy and abrasion-free. The hand pockets are large and deep but have no closure to ensure contents stay in. One exception is a right-sized key loop attached to the waist cinch tabs deep in the left pocket. It does provide secure attachment for a key or small carabiner. The zip pocket at the chest is big enough for a larger iPhone but it does bounce a bit unless you’re wearing a pack over top. The fitted scuba hood is fantastic. My larger head and ponytail fit snugly inside with the neck zip all the way up and my chin and mouth remain cozy. Great fit here—I love it. Size-wise, this piece seems to be on the roomier side for my between-sizes body. I received a medium but would in hindsight have preferred it in a small as I think that would have maximized the warmth if it was more form-fitting. I’m really happy with my first foray into Outdoor Research running (or any high-aerobic-activity) gear, and I’ll definitely be happy to explore more pieces as my gear needs arise. I’d not hesitate to take any of these pieces into the backcountry for mountain adventures, and I’m also quite content to continue wearing them after the adventure to the coffee house, the taco shack, and in the comforts of my own abode. Have you tried any of these pieces, either in the women’s or men’s models? What are your thoughts on them? Have you run in other Outdoor Research winter apparel? 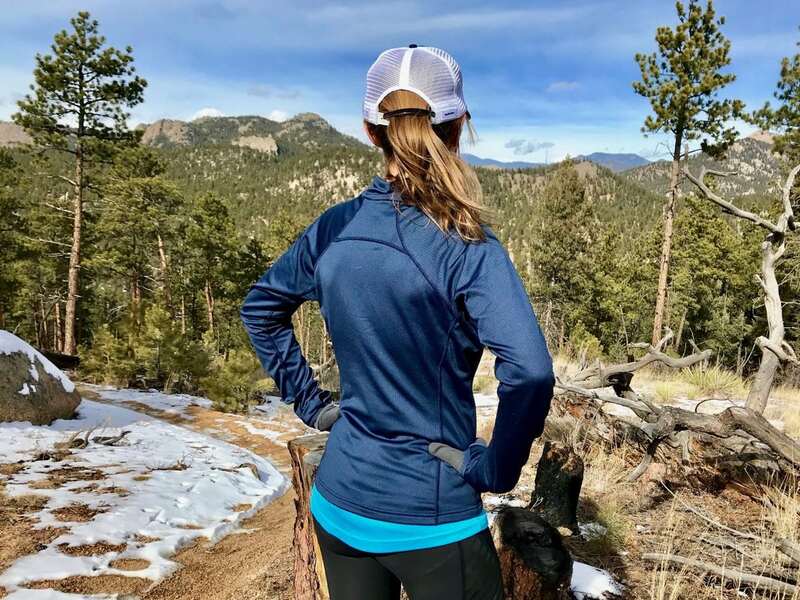 How have you found that their high-energy-output apparel, which are made for use in multiple winter sports, work for running?